This lease agreement has been drawn for letting a single retail unit or shop within a parade of properties owned by the same landlord. The space might be used for retail of goods, as a restaurant or cafe, for services such as estate agency. The document presumes upper parts of the building are let separately. This lease has been drawn to let a retail unit or shop within a parade or block owned by the same landlord and where tenants share some facilities and services. The unit could be used for any purpose, whether retail of goods, as a restaurant or cafe, or for service provision such as PC repair or travel agency. The document has been designed to maximise the capital value of the let property and to provide acceptable security to a financial institution. As drawn, the interest of the landlord always comes first. If you don't need service charge recovery provisions, use this lease instead. If the tenant will also live at the property, we offer a lease for a mixed use property that includes a residential space. This lease is one of a collection of templates designed for use by property professionals: experienced landlords, solicitors and surveyors. Accordingly, the provisions are very thorough. 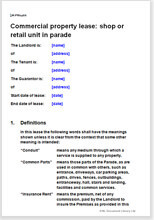 If you are not familiar with leases, you may wish to look at our standard version for a shop in a parade. That version contains fewer technical provisions such as a draft authorised guarantee agreement, fewer landlord's warranties, and less detailed and extensive service charge provisions. Within the extensive accompanying guidance notes, we have provided a discussion on use of security deposit agreement and a template for it. the RICS' Code on Service Charges. In balancing the codes with the law and the interest of the landlord, we have tried to comply with the codes but nevertheless, have preferred the interest of the landlord where there may be a difference. This agreement is comprehensive, providing alternative choices for important decisions. If the term of your agreement is for more than seven years, the document must be registered with the Land Registry. We provide prescribed lease clauses (PLCs) for long term leases free of charge for download here. There are instructions on how to add these within the document. There is no need to use these if your intended term is seven years or shorter.